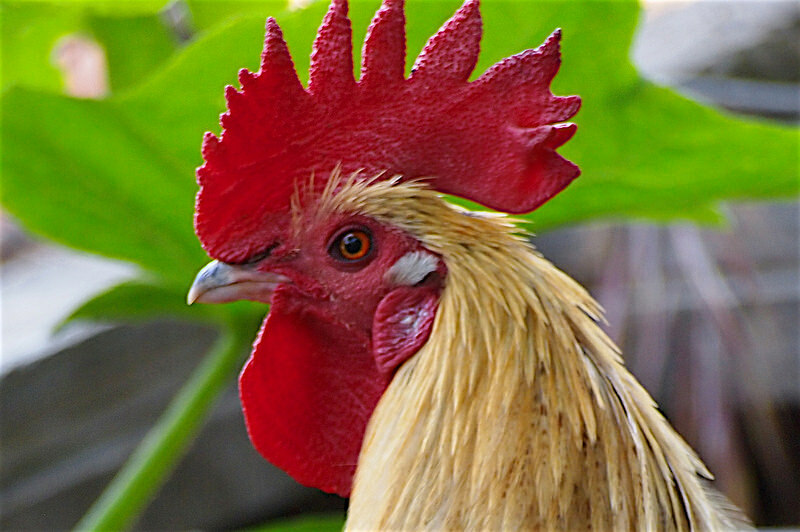 Description and photos of the 8 most common types of chicken combs and a tip to prevent frostbite in your chickens comb, wattles, and feet plus best buys on chicken health supplies! There are 8 basic types of chicken combs. The comb is a fleshy protuberance on top of the head of chickens and some other birds which in combination with the wattles acts as a cooling system to cool the birds down in hot weather. This fleshy protuberance is larger on male birds than females. Combs are usually red but can vary in different breeds of chickens such as Sumatras, Birchen, can be dark brown red in modern Game birds, Purplish red in Silkies, and Sebrights and Ayem Cemani's have purplish black combs. The Buttercup Comb on chickens is a single leader from the base of beak to a cup-shaped crown set firmly on the center of the skull and completely surmounted by a circle of regular points. The cavity within the circle of points should be deep, the texture of the comb should be fine. Cushion Comb: Solid low, moderately small comb; smooth on top, the front, rear and sides are nearly straight with rounded corners. It has no spikes. Pea Comb: Medium length, low comb, the top of which is marked with three low lengthwise ridges, the center one is slightly higher that the outer ones. The outer ones are either undulated or marked with small rounded serrations. This is a breed characteristic that is most commonly found in Brahmas, Buckeyes, Cornish, Cubalayas and Sumatras. Rose Comb: Solid, broad, almost flat on top, low, fleshly comb that terminates in a well-developed tapering spike. It may turn upward as in Hamburgs, be nearly horizontal as in Rose Comb Leghorns, or follow the contour of the head as in Wyandotes. The top surface of the main part should be slightly curved like the exterior of a circle or sphere and studded with small rounded protuberances. The general shape varies in the different breeds. Silkis Comb: Almost round, slightly lumpy comb, usually greater in width than length; covered with small corrugations (parallel ridges or grooves like a corrugated surface) on top and crossed with a narrow crosswise indentation, slightly to the front of the comb. Sometimes two or three small rear points are hidden by a crest, others are without points. Generally they are considered to be genetically a rose comb changed by a rose comb plus crest. Single Comb: Moderately thin, fleshy formation of smooth soft surface texture, firmly attached from the beak along the top of the skull with a strong base. The top portion shows five or six rather deep serrations or distinct points, the middle points being higher than the anterior or posterior, forming a semi-oval when viewed from the side. The comb is always erect and much larger and thicker in males than in females; may be lopped or erect in the female. This depends on the breed. The comb is divided into three sections: the front or anterior, the middle and that extending past the rear base of the skull, the posterior or blade. Strawberry Comb: Low comb that is set well-forward. Shape and surface resemble the outer part of half a strawberry with a large end nearest the beak of the chicken. V-Shaped Comb: Formed of two well defined horn like sections that are joined at their base, as in Houdans, Polish, Crevecoeurs, LeFleche and Sultans (1).